I'm not sure how many of you who visit Original Art Studio know about the new photo challenge I will be hosting over at my other blog, Pixel Dust Photo Art. I'm all hooked up with inLinkz and ready to get started on Friday, September 9th. This post contains a few of my thoughts about this new artistic showcase I am calling Photo Art Friday. Have you ever attended a vernissage - a reception hosted by an art gallery to launch a new body of work by one of the artists it sponsors? The word 'vernissage' comes from the French 'to varnish'. Originally interested patrons were invited to the gallery while the artist put the finishing touch of varnish on their latest group of paintings. Generally one or more rooms in the art gallery are devoted solely to the artist's work, and wine and h'ors d'oeuvres are served. Friends, patrons, clients gather to examine the new paintings and whispered critiques are muffled by soft background music. The artist is available to answer questions and is usually quite nervous about how their work will be received. 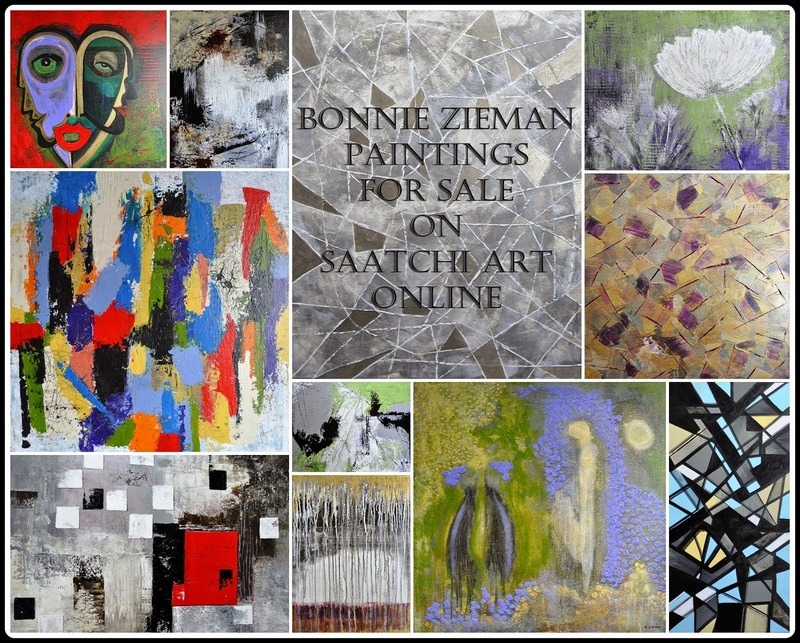 After the vernissage, only one or two of their works will be on display in the gallery, but the whole collection can be viewed on-line or in a catalogue produced by the gallery for those who want to purchase. 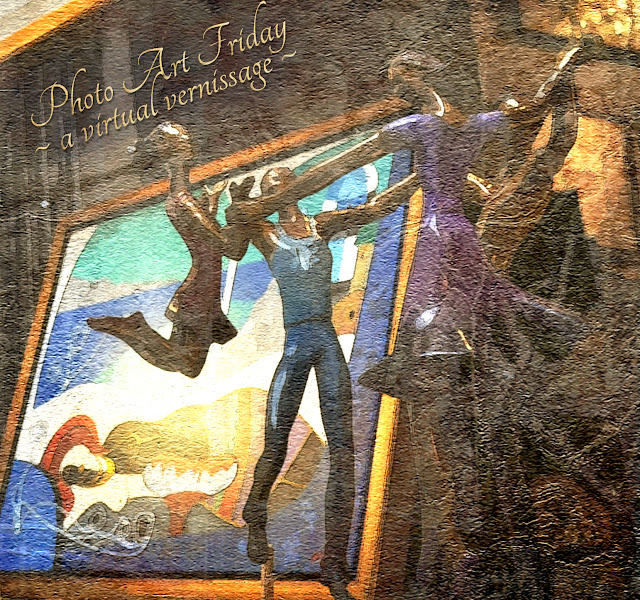 I've begun to imagine the upcoming Photo Art Friday as being something of a virtual vernissage - a group vernissage where we can display our 'wares', answer questions about how we created the piece, and receive the feedback of interested visitors. 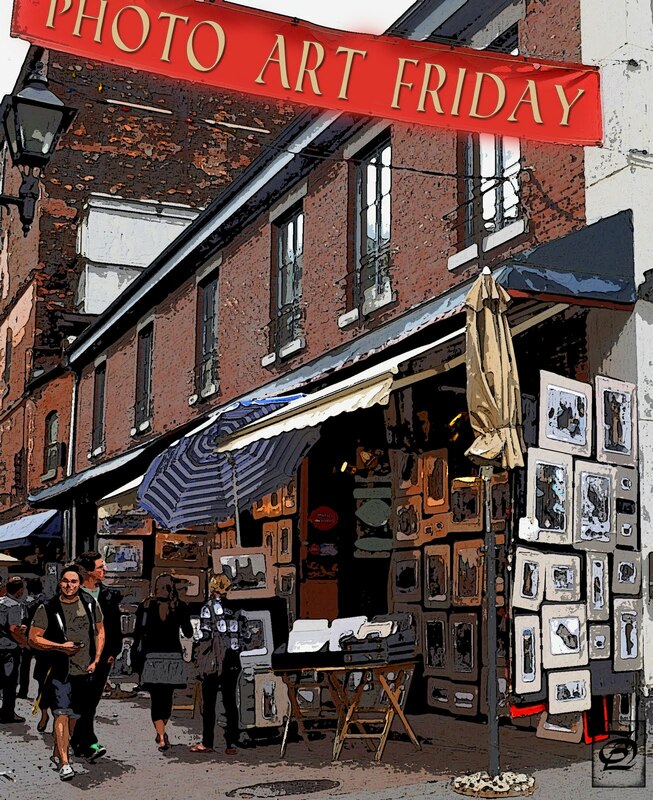 Are you ready for our first Photo Art Friday 'virtual vernissage'? It's only a few days before the launch and, I for one, cannot wait. Perhaps some of you will consider spreading the word by displaying the button "Photo Art Friday" (that you can copy from the Pixel Dust Photo Art sidebar) on your blog. While I know it takes a little time for these photo challenges to become known and grow, I can't help but hope for a good number to participate in the first one on Friday, September 9th. For those of you who like to get your submission in early, the Photo Art Friday post on Pixel Dust Photo Art, with the inLinkz tool will go up a few hours early, on Thursday, September 8th at 7:00 p.m. EST. It will remain open until the following Monday, September 12th at 7:00 p.m. EST. So for those of you who don't care about being early, or who are just learning about this new photography challenge, you will have the whole weekend to prepare, post and submit a piece of photo art. If you want to remind yourself about the guidelines for participation you can click here. Thanks for the history lesson. It was very interesting. I don't think I'm ready to compete, but I'm eager to see what every one else submits! I am intrigued with your whole idea and can't wait to see what evolves. Love it when someone starts something new such as this. I wish you much success and hope to join in perhaps one day! Both works are beautiful ! Great images of Art. It sounds like a fine idea, and I'm sure you'll have fun with it. I'm lucky if I can get my own blog together from post to post, so I don't tend to participate in events like these, but I'm sure I'll enjoy seeing what everyone has to display. Good luck and enjoy! Very interesting, Bonnie. i'm on my way over to Pixel Dust to check this out. Would love to participate - but can't start till after the wedding - this will be an ongoing event, right? How exciting Bonnie! I can't wait! I'm off to visit Pixel Dust. Beautiful images to go with it. This challenge will go from strength to strength, I'm sure.